The joy of wine tasting is one of those acts that continues to develop as you try more and more wines. At first you might appreciate a flavor or scent and eventually you learn to look at the color, the grapes used and then onto the sweet, sour, salty and bitterness of the wine. When you're first starting out with wine it can be a little intimidating which is why the team over at Bordeaux Undiscovered have created this great tool to teach you some early tips for tasting wine. 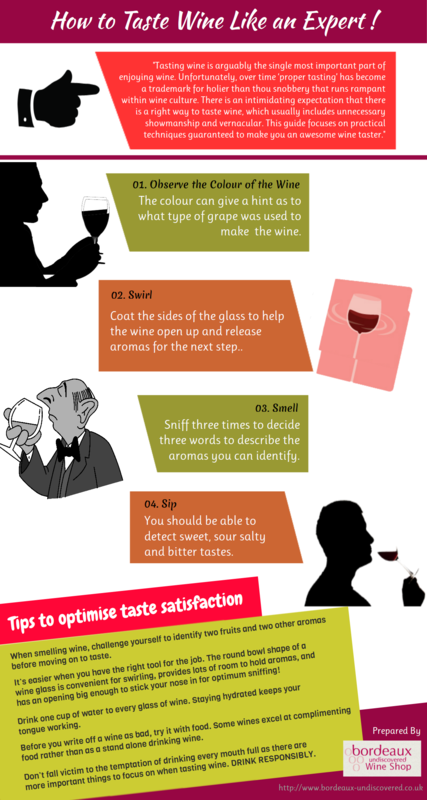 It gives four main points to use when you first start wine tasting and some interesting pointers to optimize your the taste satisfaction during your next wine tasting session. For even more great wine tasting tips check out these exclusive FDL videos with Andreas Larsson.